For those who doubted John Chen's ability to turn around BlackBerry, or wondered why he got that huge five-year contract extension, the time has come to put those thoughts behind you. After exiting the hardware business, licensing the BlackBerry name and its version of Android to three companies, and focusing on the automobile business and the IoT, Chen has yet to meet his Waterloo at Waterloo. For its fiscal fourth quarter, BlackBerry reported record software and services revenue of $218 million (non-GAAP) and $212 million (GAAP). The previous record was just set last quarter. For the period, BlackBerry turned a profit on a non-GAAP basis of $19 million, or 5 cents a share. Using generally accepted accounting principles, the company was $17 million in the red for a loss of 6 cents a share, fully diluted. 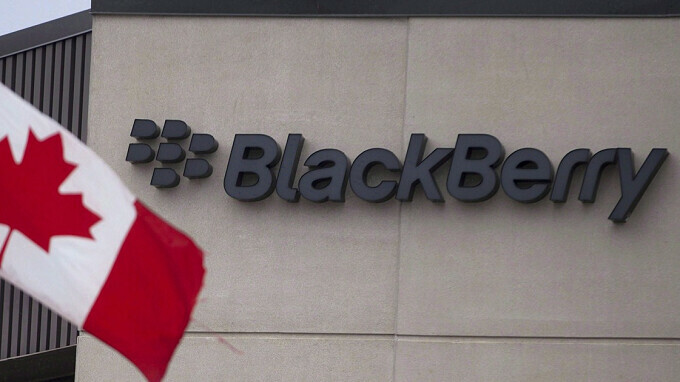 As of the end of February, the company continued to be flush with cash, a BlackBerry hallmark. The company had $2.4 billion of cash and cash equivalents in its vault as the quarter ended. And no, we don't believe that Mr. Chen likes to dress up as Scrooge McDuck and jump into a pile of gold coins. For all of fiscal 2018, BlackBerry grew its software and services revenue by 14% to $782 million (non-GAAP) and by 20% to $747 million (GAAP). Earnings per share rose from 6 cents to 14 cents for 2018 (non-GAAP), or 76 cents a share (GAAP). The company reported free cash flow of $76 million. For 2019, BlackBerry forecasts double-digit growth in software and services revenue, and expects to be in the black on a non-GAAP basis. After soaring at the open and hitting a high at $12.99, BlackBerry's shares have lost momentum after investors digested the report. The stock is basically flat at $12.40. Keep it up Blackberry! Less than 1 million BB branded phones sold last year and yet Blackberry themselves grew from their licensing and software side of the industry. So far their new business model is paying off! I would be interested in knowing how long these licensing deals are for. Word has it that TCL might be releasing something this year with another iconic brand that could eat into BlackBerry sales - Palm. Whatever they choose to release I hope they kill it in hardware design and market positioning. Because in my eyes anyway, TCL's design language is slowly coming off the rails. They hit a homerun with the DTEK60/Idol 4S with Windows but everything else has been rather bland and uninspiring. A launcher would be interesting as this would most likely will be an Android device. However, LG owns WebOS now so any use of it or it's likeness would probably require an agreement between the two companies. Patience Grasshopper! LG recently opened up webOS for developers so there's a squint of hope left. I have every finger and toe crossed. webOS was innovative software marred by very terrible hardware. Actually I would rather LG implement it into their android devices. TCL bought the Palm brand long before it had Blackberry, which to me suggests that they’ve planned for the two to coexist for a while now. And let’s not forget that Palm and Blackberry have generally had two different target audiences, even though they both shared a keyboard-esque design language. Blackberry is more geared towards professionals whereas Palm is more geared towards the general consumer. While it can be argued the old Palm Treos of the day were for the young professionals, if you looked at products like the Palm Centro and Pre and Pixi they were all geared towards the normal consumer market. I generally agree with you but the Treo line was aimed at us stuffy old farts who demanded the marriage of a PDA with a phone. I was in my mid-40s at the time but my memory still works properly. Most of the time anyway. Palm dropped the ball by not giving us that sweet Foleo companion but that's a topic for another day. I do agree the Centro was a teen-oriented device and the Pixi for young adults. But the Pre was definitely a Treo replacement - again, for us older folks. I think this just proves that blackberry is killing it in software and licensing, but hardware is pretty much dead. With less than a million KeyONE devices shipped, I think it's clear that blackberry just focus on software now and just avoid trying to continue with the hardware side of their business. Unless they change their tune, like pricing their devices more affordably, then they may be able to turn their hardware side back around. Are you ever going to get it through your thick skull that BlackBerry has nothing to do with pricing, marketing or anything else related to hardware? THEY LICENSE THEIR NAME AND SOFTWARE ONLY. “After exiting the hardware business, licensing the BlackBerry name and its version of Android to three companies....” Even says so in the article itself, lol. And? That doesn't change anything in my response. But it certainly proves your response to be wrong concerning BlackBerry and Smartphone hardware. LMAO! You supposedly have an iPhone, remember so why do you care? You don't want to admit it but you know that I am right about blackberry. I do have an iPhnoe 8 Plus, and I can post actual pics to prove it. Can you say the same for your supposed KEYᵒⁿᵉ? But what Smartphone I own has nothing to do with me dispelling falsehoods. You don’t want to admit it, but you know that I’m right. I even posted a link to back myself up. Where is your link to back up your conjecture? I never said anything about your ownership of a smartphone had anything to do with dispelling falsehoods that exist in your head. 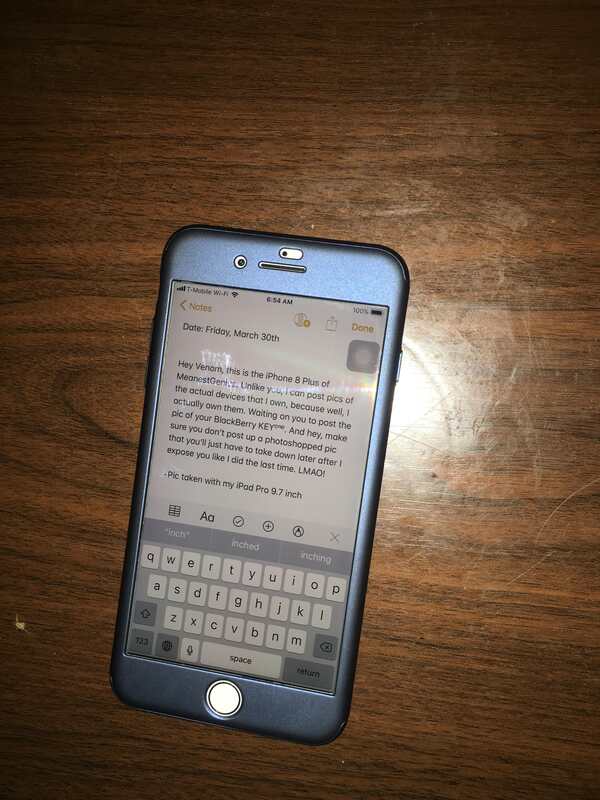 The fact that you pretend to own an iPhone just proves my point. We both know that you're just lying. As for my link, one needs to look no further than the article that talks about the amount of KeyONE devices that were shipped, not sold. So then why did you bring it up my ownership of a smartphone in the first place? And the falsehoods don’t exist in my head, they come tumbling out of mouth at warp speed. I will post an Imgr of my iPhone to prove you wrong like I usually do. But I guarantee you won’t post a pic of your imaginary BlackBerry KO. That’s because you’re lying about owning one. That “link” has nothing to does not prove that BlackBerry is still in the smartphone hardware business. Nice try, though. If you're trying to say that poo tumbles out of your mouth at warp speed then I agree. I brought it up because you claimed to be so loyal to blackberry that nothing would sway you from the KeyONE or blackberry. But I guess even you can no longer deny the truth that has been said for some time now. Like you usually do? Not sure what you mean by that, but get on with it since you claimed to own the iphone. Doesn't matter what you say about me. My main device is my Pixel. You can dismiss it all you want, but it doesn't change anything nor does it eliminate the low numbers. Lol, the fact that you’re resorting to insults proves that you lost. I never said nothing could sway me from anything. You’re making stuff up to suit your false narrative, as usual. You can continue to try and deny the truth, but the fact is that BlackBerry is no longer in the smartphone hardware business. This is a fact, whether you want to admit it or not. Lol, so you can’t provide an image of your supposed BlackBerry KO because you really don’t own one. Got it. I’ve posted pics of my devices before to you in your other account, and all you did was post a photoshopped image that you immediately pulled from your Imgr once I pointed that out. I can also dismiss your false claims of BlackBerry still being in the smartphone hardware business. I'm not resorting to insults. If it doesn't apply to you, then you shouldn't get offended. I'm not trying to make up anything despite what you want to believe. I think you have me mistaken for someone else once again. You continue to refer to me as someone you engaged with previously, but that is not the case despite what you say. You are mistaken once again. Yeah you've said that already. Still is a crutch answer. You just slung an insult, so how are you not resorting to one? And yeah, you are making stuff up. As usual. No, I don’t. And even other users here have pointed out who you really are. You are only fooling yourself if you think we don’t know. Facts aren’t “crutch answers”. Only those that try and change the facts to suit their false narrative think that. Guess that means you. By the way:https://i.imgur.com/5AFIFCo.jpg Waiting on you to post that pic (not a photoshopped one) of your actual BlackBerry KEYᵒⁿᵉ that you claimed to own that own, but I know that you’ll never post it because you don’t own one. That was brutal AF. Nice touch with the message on the phone. That was a nice touch? I thought it was a little on the childish side. LMAO! And he won’t post a pic of his supposed BlackBerry KO, because he doesn’t own one. What are you talking about? I haven't posted anything that was photoshopped. Sure you aren't seeing things? Yeah, you did. We both know when, too.